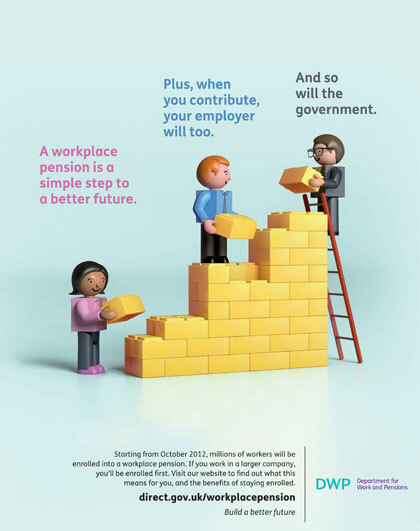 The Department for Work and Pensions is launching an £11m ad campaign to inform the public about the impending arrival of its automatic enrolment workplace pension scheme. The campaign, created by DDB London, launches nine months before the new scheme, which will enrol employees automatically into workplace pensions from the beginning of October. Press, radio and outdoor ads will run in waves until then, in a campaign planned by Manning Gottlieb OMD. The press ads feature toy people talking about pensions while building a staircased block. A woman in pink at the bottom of the block says, "A workplace pension is a simple step to a better future", while the two men at the top of the block inform people that when "you contribute your employers will too" ... "and so will the government". The ad directs people to the Directgov website to find out more. Steve Webb MP, the minister for pensions, said: "As we head into the final stretch before millions of people begin to be enrolled into a workplace pension, it is vital that we make sure that individuals and employers know what to expect. "Automatic enrolment will transform this country, putting an end to the decline in pension saving and setting millions on course for a more prosperous retirement."